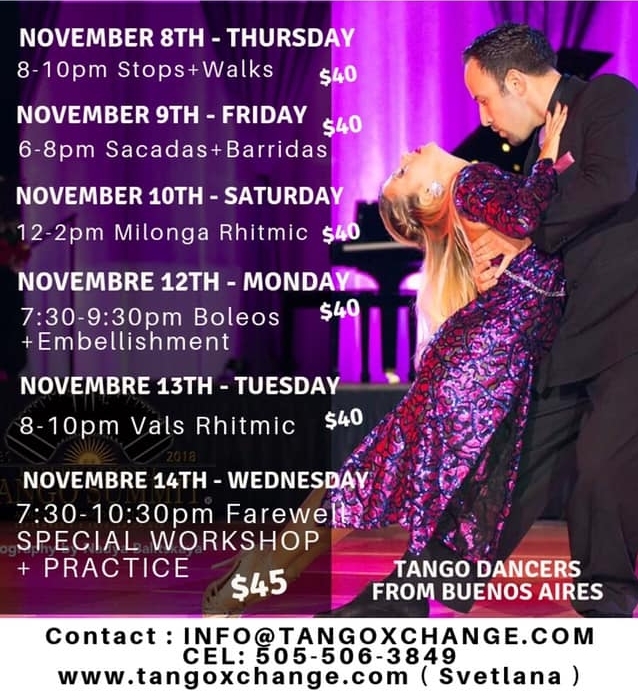 Analía Centurión is an internationally renowned Tango dancer and instructor. From the tender age of 6, her formation included piano and classical ballet. She began to dance Argentine Tango in 1995. Two years later she became stage tango champion in the most prestigious youth competitions in the province of Buenos Aires. Her trajectory includes dancing with the companies of Juan Carlos Copes, Mora Godoy and the great Mariano Mores, as well as some of the most famous Tango Dinner/Shows of Buenos Aires: Piazzolla Tango, Madero Tango, La Ventana Tango and many more. In the halls of Buenos Aires, she learned with great milongueros such as Mingo Pugliese, Puppy Castello and Gerardo Portalea. Performing in the most famous milongas: La Baldosa, El Parakultural, Sunderland Club, etc. She also studied and graduated from the academy “Estilos de Tango Argentino”. Most recently she has represented her Argentine Culture in the Vail International Dance Festival, along great stars of the American Ballet Theatre and Martha Graham Dance Company, amongst others. Her artistry gained her recognition in magazines like The New Yorker and made headlines nine times in the the New York Times. She was Jury at the Tango World Championship in Buenos Aires and Metropolitan of tango in Buenos Aires. As a teacher, she has participated in numerous international Tango Festivals: London (2009), Seúl (2010), Beijing (2009), Hong Kong (2012), Paradise Bali (2015), Sydney (2012 & 2014), Red Carpet Tango Festival (Las Vegas, 2012-14), Argentina’s Dancing with the Stars, Yakarta (2013), Japan (2009-2010), Toronto (2011), Istanbul (2015), Caserta (Italy, 2016), Colombia, Germany, Mexico, Greece, Baltic Nations, Stockholm and many more. Argentine native Jeremias Fors was trained musically by his father since he was seven years old, and attended the music programs of New World School of the Arts and Florida International University on full scholarships as a Music Performance Mayor. This training and discipline then carried over into the tango: As a dancer, teacher and choreographer. In 2010 he co-founded the company Tango Axis LLC. and created the shows “Eras del Tango” (2010) and “Amor Porteño” a.k.a Tango Suites (2016). Jeremias has also performed and choreographed with the following shows and groups: Maria de Buenos Aires (Atlanta Opera 2017, New Orleans Opera 2017, Nashville Opera 2017, Florida Grand Opera 2013), Luis Bravo’s Forever Tango (2016), the U.S. tours of This Is Tango Now-Identidad (2013, 2012), Masters of Tango by Tango Fantasy (2011), La Magia del Tango (2016, 2015), A Puro Tango II (2014), Amor de Tango (2011), Tango Lovers (2009), Lancaster Symphony, South Florida Chamber Orquesta, Sexteto Milonguero, Anibal Berraute Quartet, Quintango, Guillermo Petri’s Grand Orquesta, Alvaro Hagopian Trio, Artango Dance Company, Tango Fantasy and Dance South Florida Entertainment, among many others. His dancing in the FGO’s interpretation of Piazzolla’s Operetta; “Maria de Buenos Aires” and Robert Rodriguez’s musical piece “Tango”, both directed by Jose Maria Condemi, were chosen “Top 10 Performances of 2013″ by South Florida Classical Review.